I am so excited about today. 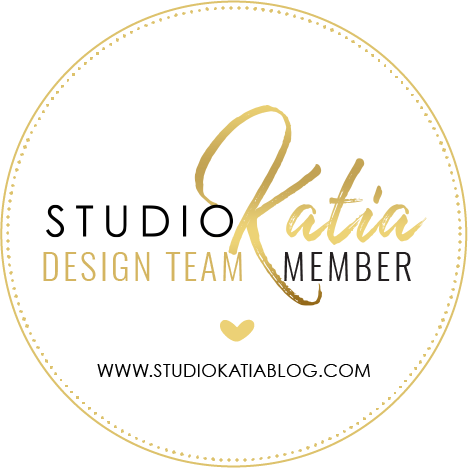 It's a release day at Studio Katia and I can finally share with you my card I created for today. And there will be many more coming with those beautiful new stamps. I'm not going to keep you any longer. Enjoy all the new products and gorgeous projects from the Team! To celebrate this February 2017 release, Studio Katia is giving away ENTIRE NEW RELEASE to two lucky winners. How awesome is that!! One winner will be randomly selected from Blog and one on Instagram. Both winners will be announced on March 1, 2017 on the Studio Katia Blog. To enter leave a comment on every stop of this Blog Hop (for your convenience full list is at the bottom of this post). Make sure to leave all the comments by Tuesday 2/28/2017 11PM MT. You should have arrived from Valentyna's Blog and your next stop is Svitlana. I created two cards for today. Here's my first card I made using Together We Bloom Set. Those flowers are so pretty. I enjoy colouring them every single time. You can see the second card I made for today on my Instagram and join another hop there. I really liked your card. It's so vibrant. The stamp set is lovely. Ох! Цвет кофе и золота просто преподносят цветы на уровень обалденности! I absolutely love flowers...this is a must have!! Beautiful card! Simply beautiful! Love the rich colors! Gorgeous flowers framed with gold, looks awesome! Gorgeous. Love The beautifully colored flower and the gold frame and sequins. Gorgeous card! I love the flowers and your awesome coloring! They look fabulous against the dark woodgrain background! Oh my!!! What a stunning card!!! !Love so much this beautiful release!!! Very gorgeous woodgrain infused look...the flowers are stunning! So beautiful, love this stamps set. Your card is lovely with the colorful booms and touches of gold. 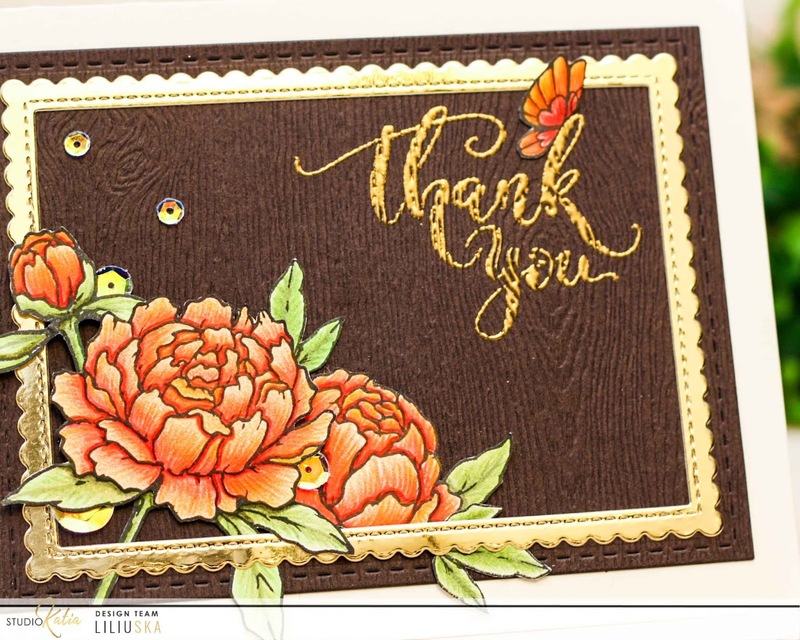 What a stunning card Liliya! I love the rich brown and oranges together! 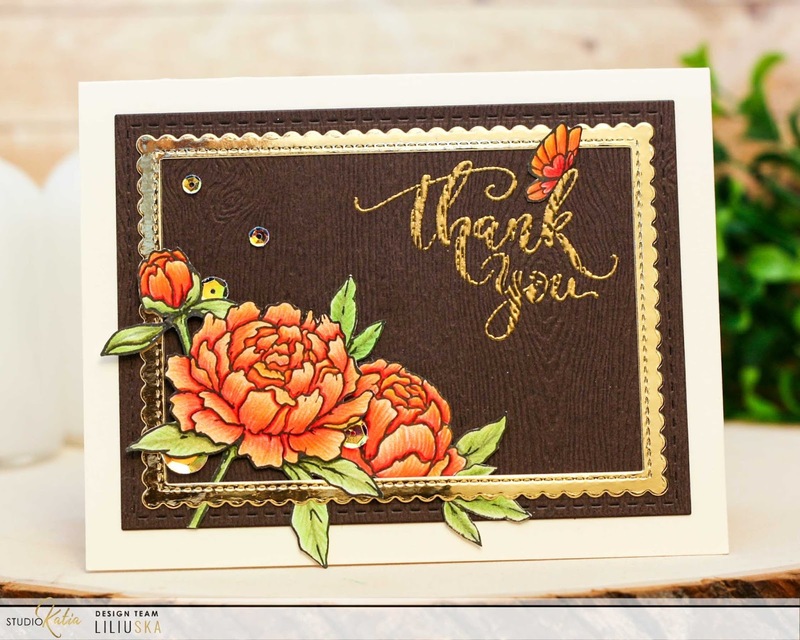 Gorgeous details on your card! Love the touches of gold too! This is gorgeous!! Love how you coloured the flowers and the brown/wood with the gold is stunning! !